The Danny Lang Teaching, Learning & Event Center at Umpqua Community College in Roseburg is now open. This jewel in UCC’s crown now houses the college’s Southern Oregon Wine Institute, where students enrolled in UCC’s viticulture and enology program can earn a two-year associate’s degree. SOWI, which was established in 2008, now also serves as an “incubator” for those who have completed the degree and want to try their hand at more winemaking without the capital expense. Within the state-of-the-art facility, staff and students have access to winemaking equipment for instruction and production. The 24,000-square-foot building also contains a premiere meeting space available to the public, a culinary arts kitchen that can provide everything from a five-course meal to coffee and cookies, and a tasting room where students will learn how wines appeal to the public. ETS Laboratories, the leading independent laboratory serving the global wine industry today, is also on site to provide testing services for students and established Southern Oregon winemakers. The building is named for Douglas County attorney Danny Lang who made the first and leading gift, $800,000, which enabled the project to begin and encouraged others to give. The UCC Foundation raised $2.5 million from about 250 individuals, foundations and other organizations to construct the building. Contributors — from timber barons to bankers, real estate investors to individual donors — believe education and wine prosperity will boost the entire region’s economy. More than 85 percent of the funds to build the $7 million Danny Lang Center was spent on local labor, contractors, materials and systems. More than 200 workers, residing largely in Douglas County — from 60 contractors, subcontractors and vendors — worked on making the center a reality. SOWI Director Chris Lake says he is “most impressed with the level of craftsmanship that went into the construction of this facility. Set on top of a hill, the new center is the first major academic facility built on the UCC campus since the 1970s and is an architecturally significant design; it strikes a balance between a contemporary style and familiar, classic cues taken from existing campus architecture. The Danny Lang Center’s surrounding vineyards, named for Scott Henry, are one of two specific sites honoring individuals key to launching SOWI. Henry, a prestigious Umpqua Valley winemaker and owner of Henry Estate Winery, was instrumental in getting the project started. 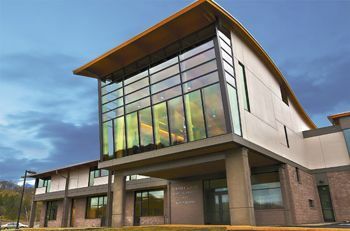 The Dr. Blaine D. Nisson Library is named for the former president of UCC who listened more than six years ago to the industry’s pleas for educated workers and then asked the community to help fund the institute and the center. Nisson says SOWI is one of his top achievements. Inside the wine library, Southern Oregon’s timber industry is represented. The room was donated, designed and built by Victory Builders of Roseburg. Currently it displays historical wine artifacts, donated by the Douglas County Museum — dating from 610 AD. In time, a collection of the finest award-winning wines from Southern Oregon will be displayed in the wine library. The Danny Lang Center has many in the wine industry excited for the future of Southern Oregon wine, including Michael Donovan, RoxyAnn Winery’s director of national sales and marketing, and president of Oregon Winegrowers Association. 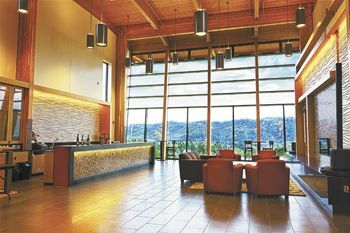 “Both established and new wineries and vineyards stand to greatly benefit from the Danny Lang Center at Southern Oregon Wine Institute,” Donovan said. 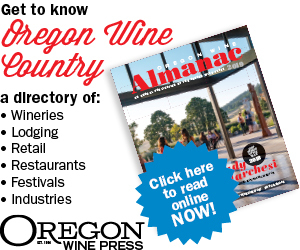 “It not only will offer a much needed resource for prospective employees of the wine industry to gain a quality education in the field of enology and viticulture, but it also will provide critical analytical laboratory services to the many winemakers in Southern Oregon. For more about the Lang Center, visit www.sowicellars.com.